Yesterday we went and visit the Tower Of London. The kids are on half term break and Jenny wanted to get out of the house. 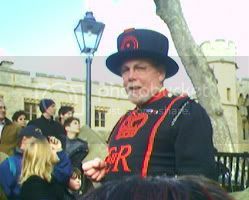 It's one the major London tourist attractions that we still hadn't visited and K* had been learning about it in school. It's still early in the year so the crowds were thin. For most of the year, the place is packed; that's one of the reasons we haven't visited before. Still, it was pretty chilly walking around. 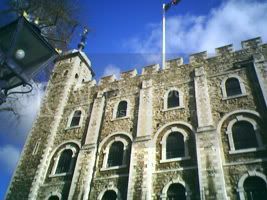 Of all the historic building in England, the Tower reigns supreme as the place where history happened. There's lots to see and read. We went on the guided tour. The guide (pictured above) was very funny with many well rehearsed jokes. We visited the chapel, the ravens, the crown jewels and the armories in the White Tower. We ran out of time before we could go see the Bloody Tower and some of the other displays. Overall, it's well worth it when it's not so crowded. If you like to look at everything, you need four to five hours.